Dinner is served from 6 pm. to 10 pm. American Nouvelle and Rustic Contemporary Mexican Food. 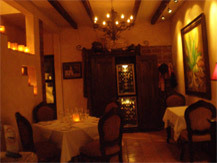 Restaurant H is located at 1505 Alvaro Obregon Street in the heart of the popular restaurant and art gallery district of ‘Old Town’ San Jose del Cabo. 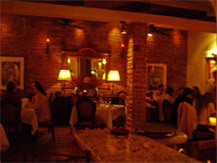 It is housed in a newly remodeled two-story colonial style building with the restaurant and kitchen occupying the first level and restrooms, office and storage on the second floor. The custom designed kitchen is open to the dining area which consist of four tables in the interior dining room and eight in the patio area, total seating for 38 persons. Cuisine will be International in style with offerings of outstanding old world and newly created Mexican recipes as specials by Restaurant H Chef, Luis Herrera Thatcher. Fine selected wines and liquors will be available from the cave and bar. The decor is reminiscent of Mexican Colonial Style in which the patio is always an important and comfotably inviting dining area. Restaurant H will serve dinner six days a week. We will also offer catering services for our clients in the comfort of their private homes or for special events for eight to twenty guests. 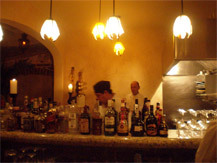 As Director, Luis Herrera Blanc offers over forty years of experience to clients of Restaurant H, the last eleven were spent in Los Cabos both at Querencia and Club Ninety Six where his old world charm and the ability to set a perfect ambiance has unfailingly pleased his friends and patrons.